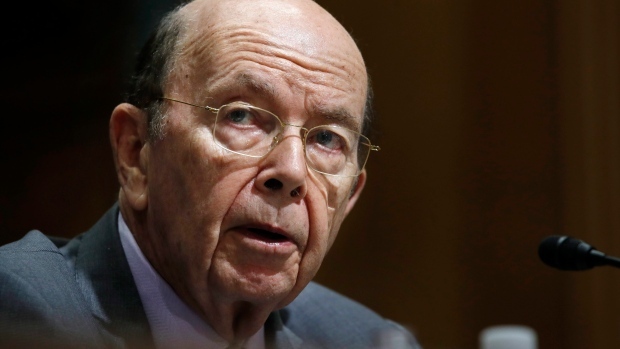 OTTAWA -- U.S. Commerce Secretary Wilbur Ross says Canada is not a national security threat to the United States and that a revitalized NAFTA could make the Trump administration's tariffs on steel and aluminum go away. Ross also acknowledged Wednesday that the U.S. doesn't have a trade deficit on steel with Canada. In fact, he said it has a surplus with its northern neighbour in terms of dollar value. Ross made the comments in Washington to a U.S. Senate committee that's examining tariffs imposed by Trump on some of that country's closest partners, including Canada. The duties are based on the premise the countries are threats to American national security under the controversial Section 232 of U.S. trade law. The remarks by U.S. President Donald Trump's point person on tariffs provided some encouragement for Canadian Foreign Affairs Minister Chrystia Freeland. Freeland said later Wednesday that officials have been trying to convey the message to Washington that the trade balance on steel isn't tilted in Canada's favour and that it poses no national security threat to the U.S.
"We think that is self-evident, and that is what we have been saying from the beginning," Freeland said of the security issue before applauding Ross' observation on the trade balance. "(It was) good to hear all of those comments from him." Under a grilling by Republicans and Democrats, Ross heard concerns that looming retaliatory tariffs by allies, including Canada, Mexico and the European Union, would kill American jobs and drive up prices for consumers. In one key exchange, Ross played down Trump's national security rationale, and instead linked the tariffs to the unresolved renegotiation of the North American Free Trade Agreement. "The Canadian steel industry is not being accused of directly and individually being a security threat," Ross testified. "The national security implication is in the aggregate, all of the steel." Ross said Canada and Mexico were initially exempted from the national security tariffs "pending negotiations of NAFTA overall." "Unfortunately, those talks were not able to come to a conclusion," he said. "Our objective is to have a revitalized NAFTA, a NAFTA that helps America and, as part of that, the 232s would logically go away, both as it relates to Canada and as to Mexico." The Trudeau government for the most part maintains there is no connection between the tariffs and NAFTA, but when asked Wednesday about a possible link, Freeland said such a question is best put to the U.S. administration. Freeland reiterated her position that the tariffs, and Canada's response to them, are entirely separate from the NAFTA talks. In a recent interview, however, Finance Minister Bill Morneau said the NAFTA renegotiation can't continue "under the threat of tariffs" from the U.S. or Canada's own planned retaliation. For his part, Ross said U.S. trade czar Robert Lighthizer is optimistic NAFTA talks "could pick up steam" after Mexico's July 1 presidential election. A Republican lawmaker from Pennsylvania was critical of Lighthizer's insistence on inserting a five-year sunset clause into NAFTA, a position long decried as a non-starter for the Trudeau Liberals. "I'm very deeply concerned that the very provisions that Trade Representative Lighthizer is seeking would make NAFTA a much lesser agreement. It would weaken NAFTA. One of them is to have a sunset provision," said Sen. Pat Toomey, who added it would lead to a "departure of investment from the United States, which would be harmful." Toomey said Trump's use of Section 232 was "wholly inappropriate" and he renewed a plea to fellow lawmakers to support the bill he has co-sponsored with fellow Republican Sen. Bob Corker that would give Congress -- not the president -- the authority to implement that national security provision. "I wish we would stop invoking national security because that's not what this is about. This is about economic nationalism and an economic policy of managing trade." Throughout Ross's testimony Wednesday, committee members criticized Trump's tariffs. Democratic Sen. Michael Bennett challenged Ross to say whether the U.S. has a trade deficit with Canada on steel. "We don't have a trade deficit of note (on steel)," Ross replied. "We have a surplus in dollars; we do not have a surplus in physical value." Bennett also asked Ross to explain "the national security rationale for putting a tariff on the Canadian steel industry, with whom we have a trade surplus?" Ross described the tariffs as a tool to persuade allies to reduce the amount of Chinese steel that passes through their countries and into the U.S. market. Some partners, including Canada and the E.U., have already taken positive steps in that effort, he said. "The only way we're going to solve the global steel overproduction and overcapacity is by getting all the other countries to play ball with us," Ross said of U.S. allies slapped with the tariffs. "And while they're complaining bitterly about the tariffs, the fact is they're starting to take the kind of action, which -- if they had taken (it) sooner -- would have prevented this crisis." Freeland argued that Canada introduced stronger safeguards on steel well before the U.S. imposed the tariffs. She said the measures were put in place not only to ensure Canada is a good trading partner, but primarily to protect Canada's own national interest by keeping Chinese steel and aluminum from being dumped into the market.